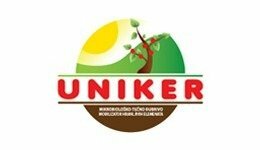 PHOSPHORUS MINERALIZING BACTERIA – bacteria thatdecompose organic phosphorus compounds. Nitrogen fixation is the process of transformation of the atmospheric nitrogen, which is present in the atmosphere (78%) in an elementary, inert form that is inaccessible to plants and animals, into (NH4) forms that may be used by all other organisms on Earth. Nitrogen-fixing bacteria are the only microorganisms able to transform gaseous nitrogen from the atmosphere into ammoniac. Symbiotic nitrogen-fixing bacteria – Bradyrhizobium japonicumforms forms nodules in the soybean root. This bacterium is inoculated at the seed and therewith establishes the symbiosis – forming nodules on the root where bacteria perform the nitrogen fixation and supply plants directly with accessibly nitrogen, while the plants supply bacteria with assimilatives (nutritive material produced during the photosynthesis). Associative nitrogen-fixing bacteria - Azotobacter sp. (3 species) found in Slavol for soybean inhabit the root surface. Nodules are not visible on the root, but there the relation between plant and bacteria is quite specific. Phosphorus mineralizing bacteria have the ability to colonize soybean root and both directly and indirectly stimulate plant growth. Slavol for soybean influences the establishment of symbiosis between soybean root and Bradyrhizobium japonicum and the formation of nodules. Bradyrhizobium japonicum enters inside of the root (parenchyma) through root hair, where they start multiplying rapidly, resulting in the formation of nodules. Nitrogen-fixing bacteria live in the nodule and transfer nitrogen directly to the plant, and the plants supply the bacteria with nutrients they produce in the photosynthesis process. Associative nitrogen-fixing bacteria and phosphorus mineralizing bacteria belong to the group of bacteria that stimulate plant growth - colonize the soybean root, positively influencing plant nutrition with nitrogen and phosphorus. These bacteria produce auxins (indol-3- acetic acid) that help the establishment of symbiosis, i.e. bacteria penetration through root hair to the root parenchyma, where they form nodules. 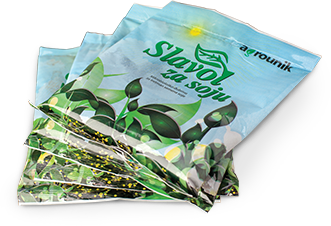 Dissolve the bag content in 250 ml of water or 250 ml of Slavol S and mix with the required quantity of soybean seed for 1 ha (100 kg) immediately prior to sowing. 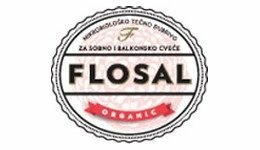 For better establishment of symbiosis between plants and bacteria, it is recommended to pour the content of the Slavol for soybeans bag into Slavol S. Slavol S contains auxins, hormones that are natural analogs to plant hormones. Auxins are plant signals for more successful establishment of symbiosis (penetration of bacteria into the soybean root system).